So many launches and cloud innovations, that you simply may not believe. In order to catch up on some service launches and features, this post will be a round-up of some cool releases that happened this summer and through the end of September. Let’s dive in, shall we! Wished you could manage access to your Amazon RDS database instances and clusters using AWS IAM? Well, wish no longer. 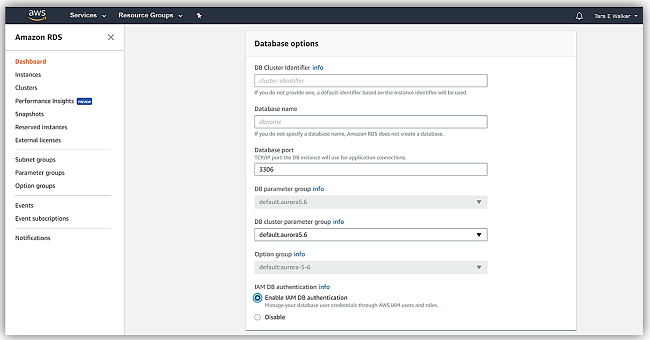 Amazon RDS has launched the ability for you to use IAM to manage database access for Amazon RDS for MySQL and Amazon Aurora DB. What I like most about this new service feature is, it’s very easy to get started. To enable database user authentication using IAM, you would select a checkbox Enable IAM DB Authentication when creating, modifying, or restoring your DB instance or cluster. You can enable IAM access using the RDS console, the AWS CLI, and/or the Amazon RDS API. After configuring the database for IAM authentication, client applications authenticate to the database engine by providing temporary security credentials generated by the IAM Security Token Service. These credentials can be used instead of providing a password to the database engine. 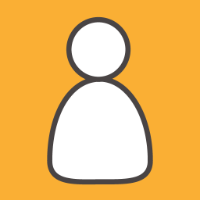 You can learn more about using IAM to provide targeted permissions and authentication to MySQL and Aurora by reviewing the Amazon RDS user guide. In order to aid Amazon Simple Email Service customers’ in utilizing best practice guidelines for sending email, I am thrilled to announce we launched the Reputation Dashboard to provide comprehensive reporting on email sending health. To aid in proactively managing emails being sent, customers now have visibility into overall account health, sending metrics, and compliance or enforcement status. Account status: A description of your account health status. Healthy – No issues currently impacting your account. Pending end of probation decision – Your account is on probation. Amazon SES team member must review your account prior to action. Shutdown – Your account has been shut down. No email will be able to be sent using Amazon SES. Pending shutdown – Your account is on probation and issues causing probation are unresolved. Bounce Rate: Percentage of emails sent that have bounced and bounce rate status messages. Complaint Rate: Percentage of emails sent that recipients have reported as spam and complaint rate status messages. Notifications: Messages about other account reputation issues. 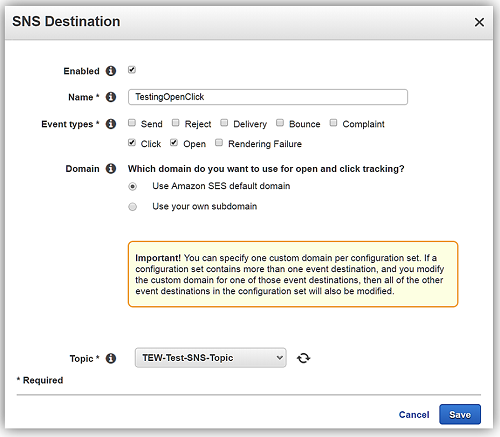 Another exciting feature recently added to Amazon SES is support for Email Open and Click Tracking Metrics. With Email Open and Click Tracking Metrics feature, SES customers can now track when email they’ve sent has been opened and track when links within the email have been clicked. Using this SES feature will allow you to better track email campaign engagement and effectiveness. When using the email open tracking feature, SES will add a transparent, miniature image into the emails that you choose to track. When the email is opened, the mail application client will load the aforementioned tracking which triggers an open track event with Amazon SES. For the email click (link) tracking, links in email and/or email templates are replaced with a custom link. When the custom link is clicked, a click event is recorded in SES and the custom link will redirect the email user to the link destination of the original email. You can take advantage of the new open tracking and click tracking features by creating a new configuration set or altering an existing configuration set within SES. After choosing either; Amazon SNS, Amazon CloudWatch, or Amazon Kinesis Firehose as the AWS service to receive the open and click metrics, you would only need to select a new configuration set to successfully enable these new features for any emails you want to send. The AWS Solution Builder team has been hard at work helping to make it easier for you all to find answers to common architectural questions to aid in building and running applications on AWS. You can find these solutions on the AWS Answers page. Two new solutions released earlier this fall on AWS Answers are Serverless Image Handler and the AWS Ops Automator. Serverless Image Handler was developed to provide a solution to help customers dynamically process, manipulate, and optimize the handling of images on the AWS Cloud. The solution combines Amazon CloudFront for caching, AWS Lambda to dynamically retrieve images and make image modifications, and Amazon S3 bucket to store images. Additionally, the Serverless Image Handler leverages the open source image-processing suite, Thumbor, for additional image manipulation, processing, and optimization. AWS Ops Automator solution helps you to automate manual tasks using time-based or event-based triggers to automatically such as snapshot scheduling by providing a framework for automated tasks and includes task audit trails, logging, resource selection, scaling, concurrency handling, task completion handing, and API request retries. 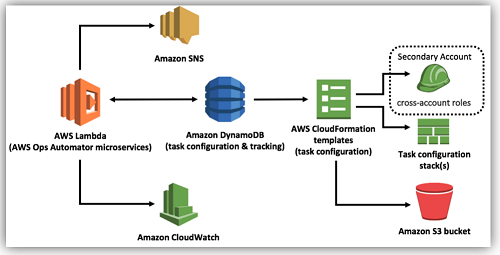 Amazon DynamoDB: a table which stores task configuration data to defines the event triggers, resources, and saves the results of the action and the errors. Have fun exploring and coding.